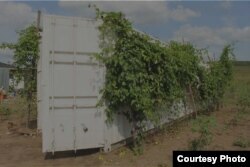 A huge shipping container in the suburbs of Denver, Colorado, is the home of some of the nation’s smallest livestock. Rocky Mountain Micro Ranch is Colorado's first and only edible insect farm, and one of fewer than three dozen companies in the U.S. growing insects as human food or animal feed. Wendy Lu McGill started her company in 2015, and today grows nearly 275 kilos of crickets and mealworms every month. “I want to be part of trying to figure out how to feed ourselves better as we have less land and water and a hotter planet and more people to feed,” she explains. Wendy Lu McGill raises mealworms and crickets to sell to restaurants and food manufacturers. Feeding the world’s appetite for protein through beef and even chicken is unsustainable, according to the United Nations Food and Agricultural Organization. Protein from bugs is more doable. Edible insects are a great source of high quality protein and essential minerals such as calcium and iron. Edible grubs — insect larvae -- offer all that, plus high quality fat, which is good for brain development. Insects are part of the diet in many parts of the world. Analysts say the global edible insects market is poised to surpass $710 million by 2024, with some estimates as high as $1.2 billion. And while American consumers comprise a small percentage of that market today, there is growing demand for a variety of insect-infused products. Amy Franklin is the founder of a non-profit called Farms for Orphans, which is working in the Democratic Republic of Congo. “What we do is farm bugs for food because in other countries where we work, they’re a really, really popular food,” she notes. In Kinshasa’s markets, vendors sell platters of live wild-caught crickets plus big bowls of pulsating African Palm weevil larvae. These wild insects are only plentiful in certain seasons. Andrew takes a tentative taste of baked, salted mealworm at Rocky Mountain Micro Ranch. Koelling gets adventurous at Linger, a Denver restaurant that has had an insect entree on its menu for three years. Culinary director, Jeremy Kittelson, says Linger is committed to changing the American palate. “As much as we love beef,” he says, “there’s no scientist who will tell you cattle farming is a sustainable practice. We should eat more insects." And so Koelling takes a forkful of the Cricket Soba Noodle dish, with black ants, sesame seeds and crickets mixed in with green tea soba noodles, and garnished with Chapuline Crickets.